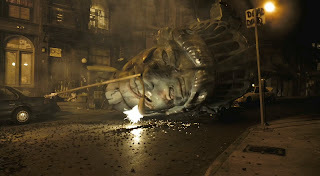 A "found footage" monster movie, Cloverfield cleverly captures the perspective of defenceless civilians as a monster rampages through Manhattan. The film is presented as an amateur video recorded by a group of New York City friends. Jason (Mike Vogel) and his girlfriend Lily (Jessica Lucas) are throwing a farewell party for Jason's brother Rob (Michael Stahl-David), who is relocating to Japan. Their talkative buddy Hud (T.J. Miller) is in charge of filming testimonials, and captures Rob arguing with his life-long friend Beth (Odette Yustman), who storms out. Meanwhile, Hud pursues the attention of Marlena (Lizzy Caplan). Thunderous explosions soon rock the area as a massive beast emerges from the ocean and starts to inflict massive death and destruction. The partygoers scatter and the army moves in, but the monster proves impervious to military weaponry. A phone call reveals Beth is in danger, so instead of evacuating, Rob, Jason, Lily, Hud and Marlena infiltrate the danger zone to try and reach Beth's apartment building. With most monster movies focusing on the larger fight to defeat the creature, Cloverfield adopts the style of and spends time with the little people who are usually the inconsequential rampage victims. Here it is the army, and to a certain extent the monster itself, that are in the background, while the film joins a small band of civilians trying to skirt the carnage. Helpless, weaponless and driven solely by courage, the survivors have to navigate a war zone using just their wits. With the what and the why of the monster's invasion inconsequential, director Matt Reeves and writer Drew Goddard (backed by producer J.J. Abrams) have to create a narrative foundation, and so the rather superficial story of Rob wanting to reach and rescue Beth is pushed into service. It's rather flimsy in terms of character interest, but sufficient to steer 85 minutes of action towards ground zero of destruction. The film's real spectacle, for better or for worse, is the hand-held camera work. Deploying the technique popularized by The Blair Witch Project, Cloverfield absolutely delivers the gritty, amateur, and right-there cinéma vérité feel; it is also borderline nauseating. Reeves makes good use of the camera's constrained field of vision to deliver startling glimpses of the monster and its scampering kin (reminiscent of creatures from the Half-Life computer game), as well as a few effective shocks, notably when the group of survivors try to make progress in the spooky subway tunnels. 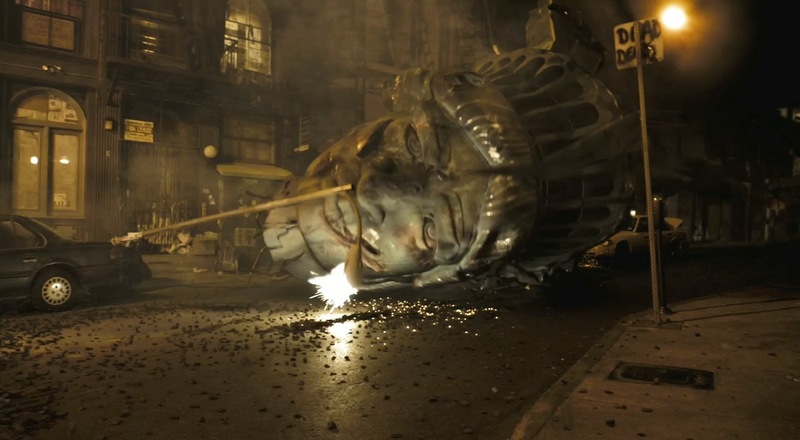 With pinches of humour, an amiable cast, and strategic dollops of gore, Cloverfield provides the requisite thrills, finally giving voice to the often trampled victims of massive ugly demons from the deep.